Coming into tonight's Buffalo versus Boston game the primary focus was the potential physical play. Since the Sabres got bigger over the off season, with the additions of enforcer John Scott and agitator Steve Ott, many Sabres fans thought they would finally receive an answer for last season's Milan Lucic and Ryan Miller incident. However, Sabres sniper, Thomas Vanek grabbed the spotlight and recorded a hat-trick and two assists in the Sabres' 7-4 win over the Bruins. This was Vanek's second five-point game of the season, and he now leads the NHL with 15 points in six games played. 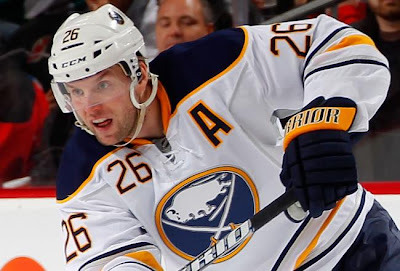 Also Sabres captain, Jason Pominville and young star, Cody Hodgson both recorded a goal and two assists on the night. While Miller turned away 38 shots for his third win of the season. Check out Vanek's hat-trick below. This particular second option a part of their own rolex replica is unquestionably much more market, however ultimately that which you possess is really a replica watches uk which has a large amount of higher expenses related to this. In addition may be the concern associated with high quality. The share Rolex view includes a high degree of describing as well as professional completing. Customized rolex replica to fulfill which primary Rolex encounter, inch should provide rolex replica sale amounts of high quality, and that's difficult to provide. Actually, among the main factors which Rolex doesn't authorize or even recommend several customized view tasks happens because these people essentially adjust the actual rolex replica uk such as the instances and frequently the actual knobs. In the event that Rolex is actually rolex replica uk a specific quality level as well as completing, high of that's changed through a good after-market customizer.